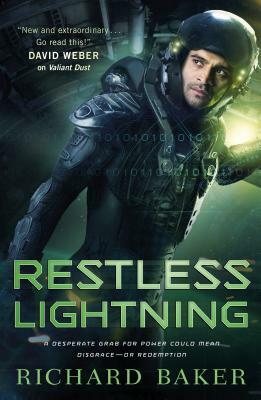 Richard Baker continues the adventures of Sikander North in Restless Lightning, the second book in his new military science fiction series Breaker of Empires and sequel to Valiant Dust. Richard Baker is a former United States Navy officer and a well-known game designer and the author of several novels. He is a lifelong devotee of science fiction and fantasy, a history enthusiast (particularly military history), and an avid fan of games of all kinds. Rich received his commission in the US Navy and served three years as a deck officer on USS Tortuga (LSD-46), earning his Surface Warfare Officer qualification. In 1991 he left active duty to begin a twenty-five year career as a professional game designer, first with TSR, Inc., and then with Wizards of the Coast. Some of Rich’s more notable game design credits include the Alternity Science Fiction Roleplaying Game, the award-winning Axis & Allies Miniatures Game, and the Axis & Allies Naval Miniatures Game—the best-selling naval wargame of all time. Rich began his writing career by working in the Forgotten Realms fantasy setting, which dovetailed with his day job as a game designer. In 2011, Rich left Wizards of the Coast. He founded his own small-press game publishing company, Sasquatch Game Studio, in 2013. With Sasquatch, Rich created the savage world of Primeval Thule, a sword-and-sorcery game setting, and Ultimate Scheme, a game for evil geniuses. He also began working seriously on his own original fiction, seeking to combine his military experience with his love of history and science fiction—an effort that led to the creation of Sikander North and the novel Valiant Dust. A native of the Jersey shore, Rich has resided in western Washington State since 1997. He married his college sweetheart, Kim Rohrbach, in 1991; they have two daughters, Alex and Hannah.